Egyptians are by and large unsympathetic to protests calling for the reinstatement of Egypt’s toppled Islamist president Mohamed Morsi. 71 percent of Egyptians voiced their disapproval of the Brotherhood-led protests which have been taking place for three weeks, according to a poll conducted by the Egyptian Centre for Public Opinion Research (Baseera). 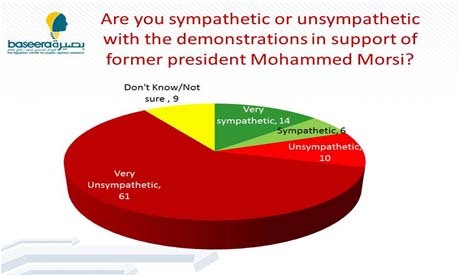 Baseera's July opinion poll found that 20 percent of those polled were in support of the pro-Morsi demonstrations, while 9 percent remained uncertain about how to view the matter. The report stated that residents of urban governorates seem less sympathetic to the pro-Morsi protests than those of rural areas. Urban residents polled at 17 percent approval, 77 percent disapproval, whereas the numbers were 21 and 67 percent, respectively, for rural residents. Morsi's Islamist backers have maintained a sit-in in north Cairo since 28 June. They have been staging protests in Cairo and other provincial towns demanding his reinstatement ever since Morsi’s 3 July ouster by the army amid mass anti-Brotherhood demonstrations. The independent Cairo-based organisation polled 2,214 adults from across Egypt's 27 governorates via telephone on 20 and 21 July. The poll’s margin of error is less than 3 percent. Based on the report's findings, male respondents are more disapproving of the protests (78 percent) than female ones (65 percent). 15 percent of women remained uncertain, versus 3 percent of men. The report revealed that age and education levels affect reactions to the pro-Morsi protests. According to the poll, sympathy declines with age, recording at 24 percent sympathetic amongst those aged 18-29 compared to 14 percent amongst those 50 and up. Sympathy for pro-Morsi protests was higher among university graduates (26 percent) than those with a mid-level education (18 percent). Unless you all come together then one thing is for sure, the Syrian way awaits you. Those of you who would drag Egypt down that road for a religious or political ideology should hang their heads in shame. How do you think the rest of the World sees you? I am neither pro Morsi nor against him. I was able to interview the FJP right after Morsi won the election & ask them every question from "What is your vision for Egypt" to "Do you intend to respect all treatys" I was impressed with their candor & their answers & their willingness to talk with me. However I am a firm believer that religion has NO place in politics because it clouds the ability of the government to truly help the people in their country, it leads to biases, favoritism and therefore splits society. Religion belongs in the heart & home! But I think Dr. Morsi was not given his chance to finish his term as the democractic process allows. It is unfortunate that people do not understand how the democratic process works but how can they? This is a learning process that all countrys go through, even the United States when they broke free of England in 1776. Freedom is not free there is a price & it takes time to get a country to that place. Egypt is in transition & it will take time to restore her to her proud "cradle of civiliztion" that she once was in the past. If you want change you make it happen by voting for who you think is the best candidate for your country, who has the education, the intelligence & the ability to work with not only Egyptians & understand what they need but has the ability to understand how to work with the global scene & interact with other countries as well. This is democracy, the rule of law. Vote, not violence! Technology & jobs is the future of the economy not religion. Welcome to 21st century Egypt. Such statistic may look meaningful at the first glance,but when looking into the detail, one is not sure if the way is appropriate. 1) The number of sampling is enough? 2) The Way of sampling is appropriate? 3) The Way of asking questions is appropriate? I don't know why you can say 71% of "Egyptians" in the headline, instead of 71% of the Egyptians who responded to Baserra poll. Assuming the population of more than 18 years old is 35 millions. 2214 answers is 0.00635 % of 35 millions. Is it meaningful in statistic terms? Where did they conduct their poll? In Al Ahram Media Center? Have you a sense of homour or think we are stupid? Stop trying to justify coup d'etat, it does not make any sense %71 of you and your likes like or hate MB. This story is a deja vu for us, Turkish people, read about 28 Feb coup in Turkey on understanding how to conduct a coup a la mode! You completely disregard that the economy was shot before Morsi was elected. Secondly, what could he do by himself, the judges and military dissovled the Parliament. When he did try to do it alone, you called him a dictator. To say that there was no other choice, means you don't care about democracy and what is happening now is a farce. What you people could have done is stop protesting and go to work. Tell the Judges to get their hands out of the Executive and Parliament's business. Instead you ran to the military and expected the world to support you. The world doesn't support you. We don't support Moris either, but he was legitimately elected and deserved to serve his full term. You clamor about the people this or that, but who cares really? Your country is a joke and you can't see why. Religion and Politics cannot succeed in today's world. MB have failed and turned out to be a DISASTER for EGYPT not only economically but socially. I am a Muslim but I do not believe in the Ideology of the MB who proved how quickly they can Bring a system to it's knees by their lack of competence to run a country like EGYPT. Economically Unemployment soared to twice as bad, tourism died, the devaluation of the currency from 5.6 to 7.1 per USD, the reserves fell from $40 BN to $13.4 BN I mean what the hell were they doing? having SO MANY DOCTORS and educated people on board why could not they reverse the country's statistics to their favour, win the people over, provide more jobs, boost industries? I did not care who comes in power as far as they serve the people and the country. The gift the MB gave to Egypt was no Fuel no Electricity no Jobs no Reserves No Tourism No Secutiry No Water (recently). All the goofs in Rabia Square have no life no work no families??? go home and get a job or do something?? how are they feeding their families since three weeks of course the MB leadership are spending money on them the ones they took from Qatar. Please weigh all the odds before reaching conclusions and decide who is the Enemy of Egypt and who is not. An infidel can claim himself to be a Muslim and only Allah knows. However a true Muslim do not separate anything from Islam as Islam is a way of life. IFLet us stop pretending and become mushrikin. You absolutely wrong about the ideology of MB, their ideology is the ideology of Anmbia and Khulafaye Rashideen, you have not searched about, The US and EU will never let them to be on the power in the world, because their ideology is to get in power in the entire world, even some of secular muslim countries would not allow them to rise on power, because their kindoms will be toppled, If you are a true muslim you will have to suffer such situation then you will reach to the power in the world. I cannot believe for a second that you are a Muslim. More like NGO staff with no further prospect of job. These troops are here to defend Islam been hijacked. They are not funded by USA, swaisiri or shafiq and the likes . Muslims use their wealth and soul to promote Islam. Sisi thought leave it by Ramadan they will go away. We Egyptians want to bring our country back from infidels. Who use our Muslim army personnel to attack Sinai and close Gaza borders . Natanyahu was pleased with yourselves today.. That is the kind of Egypt you want to build with corruption and low self esteem. Coup leaders celebrated to early. Christians are less than 2 percent in Egypt. MB are at least 40 percent. Other Islamist represent 53 percent. The rest goes for others. Alahram is not been overtaken by MB. In fact AlAhram chairman and chief editors were forced out by SIsi. His men are behind screens and yet they cannot resist the heat from Majority of Egyptians. Hate are associated with Christians and secularists . MB lead. Successfully for one year and had three more years to go. Falools refused to hold 2nd parliamentary elections. They knew majority will win again and again and again .